This course has been updated! We now recommend you take the Angular Core course. Master building web applications in Angular 1.x and ES6. With Angular 2 on the horizon, this is the best way to build Angular 1.x apps now to make sure they are ready to transition into 2.0 (if needed). This course will give you the ability to build angular apps with a modern approach. Scott gives a quick overview of the technology he’ll be using throughout this course. The ES2015 (ES6) code will be transpiled with Babel. Scott will be using Webpack and Gulp for automation. Webpack treats all files as modules. Scott explains how Webpack will be used to load, transpile, and bundle the code. He also goes into a little more detail about how Gulp will be used to orchestrate Webpack, copy files, and serve the application. Scott walks through the solution to exercise 1. Scott continues his explaining of the solution to exercise 1 by answering a few additional audience questions. Since Webpack allows the use of commonJS in the browser, node modules and NPM can be used to manage frontend dependencies. Scott introduces the ES2015 syntax for importing modules. He also overviews the import/export patterns used throughout the course. Scott continues his demonstration on how to import dependencies. He spends a few minutes talking about aliasing and shares some instances where it’s useful. 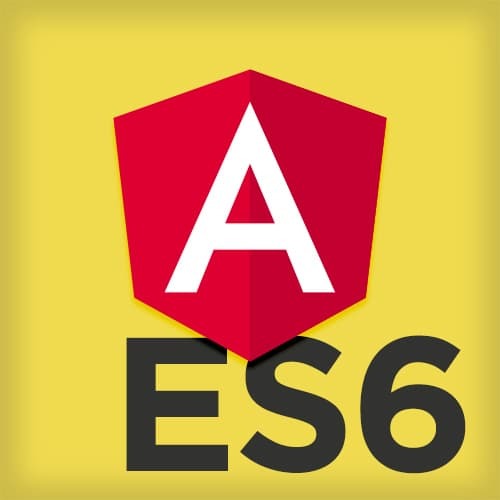 Scott also covers using the ES2015 module system alongside Angular’s module system. In this exercise, you will import a some dependencies into your project including Angular and lodash. You will also add code to export the home module. Scott begins the solution to exercise 2 by explaining the code in app.js. Scott continues his exercise 2 solution demonstration by discussing the code in home.js. Along with the var keyword, ES2015 provides developers with two new keywords when declaring variables: const and let. Scott discusses the differences between const, var and let and shares how and when he uses these keywords. A component, in this context, is the composition of functionality, UI, state, and tests. Scott gives an example directory structure for a component and overviews the many files that may exist in that directory. ES2015 classes will be used when defining any controllers. Classes have a constructor function which will be called upon instantiation. They are also able to be extended similarly to other programming languages. Scott shares some new syntax in ES2015. He looks at shortcuts for defining objects, destructuring, and creating functions. In this exercise, you will create a blog component for the application. Scott goes through the solution to exercise 3. Before getting into the exercise, Scott dives into how to unit test components. Because the application is modular, each component can be tested without loading the full application. The tools Scott will be using are Karma, Mocha, and Chai. In this exercise, you will write unit tests for the blog component. The tests will be added to blog.spec.js. Scott begins walking through the solution to the fourth exercise. He starts in the karma.conf.js configuration file and moves to the spec.bundle.js file. Scott continues demonstrating the solution to exercise 4 by looking at the specific tests written in this exercise. Before moving on to the next section, Scott answers a few remaining questions about testing frameworks. He clarifies some of the Webpack configuration and talks about the differences between Jasmine, Mocha, and Chai. In Angular 1.0, services were loosely defined. Scott describes the differences between services and factories in Angular 2.0. Because services must return a newable function, he prefers factories which can return an object of any type. Scott stresses that state should not be stored in components. He demonstrates how to use services to manage state and create an API for exposing state methods to components needing access. Scott also talks a little about how to organize services within a project. ES2015 provides developers with a syntax for pulling properties off an object and creating local variables. This technique is called destructuring. While destructuring is most commonly used with objects, Scott demonstrates it can also apply to array values. In this exercise, you will create a shared factory for getting blog posts from the JSON API server. You will also create all the CRUD methods necessary for interacting with the data. Scott walks through the solution for exercise 5. Scott continues the solution to exercise 5. He also answers a few ES2015 syntax questions from the audience. Scott takes some time to compare components across a variety of frameworks. He looks at Angular 1 & 2, React and Polymer and shares a few of thoughts on each. In this exercise, you will create the BlogPostComponent directive. This exercise contains less help than previous exercises and is intended to reinforce some concepts from earlier exercises. Scott walks through the solution to exercise 6. Since there is no standard component architecture in Angular 1.x, Scott reviews a number of points to remember when using a component approach. While responding to an audience question, Scott segue ways into exercise 7. This exercise requires you to create your component from scratch. This component allows the user to create a post for the blog. Scott demonstrates the solution to exercise 7. Before getting into automation, Scott explains how templating engines work. Most templating engines combine a template string with a set of options to create dynamic output. Scott dives right into exercise 8. In this exercise, you will add automation to the component creation process. Scott walks through a few of the files as well as the Gulp task to give a context for what needs to be done and how the command line arguments will be used. Scott walks through the solution to exercise 8. He also gives a few ideas for ways to extend automation similar to scaffolding tools like Yeoman. Scott begins wrapping up the course with a lengthy Q&A session. In the first part of the Q&A, he answers questions about using the Ionic framework, scaling shared services, and systemJS. Scott continues the audience Q&A by answering questions about server-side technologies, reducing dependency injection in controllers, Webpack vs. JSPM, and UI frameworks for Angular.